As Catholics, as Christians, as parents, as children, the Holy Family has been for us the ultimate symbol for a worshipping, caring, guiding, loving, inspiring and safe place in which to grow. Through Mary, our 'Mother of Mercy' we have a beacon of devotion to a son's cause onto his death and resurrection. Devoted parents, loving son, all were aware of the significance of their roles. From the commencement of their union, Joseph and Mary's lives were filled with danger; but from out of that they fashioned a holy proctectorship for themselves and their son. Together, they experienced wonder, joy, and fulfilment as God's plan was revealed. Before the ecstasy of divine prediction, Jesus endured treachery, was accused in the wrong and tortured to death; but his mother did not desert him, even as she suffered indescrible heartbreak at the foot of His cross. 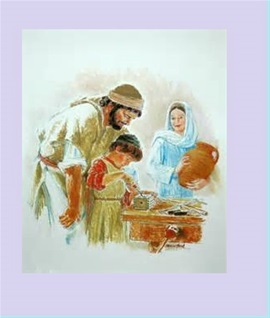 Christ was born to humble parents and raised by them in modest surroundings. Joseph's standing and skills were sufficient to provide his wife and son with a way of life which was fully supportive and dignified, but never extravagant. Against a background of latent danger to their very existence, as a family unit they survived until Jesus was ready to begin his work in earnest. Bunreacht na hEireann places great importance on the family unit as the cornerstone of Irish society calling it ‘the natural, primary and fundamental unit group of society’ and a ‘moral institution that possesses inalienable and imprescriptible rights.’ Amongst the praise that it heaps on the family unit one utterance stands tall above the others suggesting the family is ‘the necessary basis of social order...indispensible to the welfare of the Nation and the State.’ Another recognised family law expert has stated his belief that the family unit has been "placed on a Constitutional pedestal". While the constituent elements of a 'typical' family unit may not have been specifically stipulated in the Constitution, there is only one 'combination' which fulfills that of a natural unit group which is also a moral institution. This has not prevented the family unit, and all that it stands for, from being challenged in recent times, indeed blamed for many of the ills in today's wonderfully progressive Irish society. Some say that it simply does not 'work' anymore, that it is not built for purpose in today's changing world, that, like the Irish Constitution itself, it is outdated. Perhaps it is the world that is not built for purpose in its abandonment of the protection of sound, family values. While published in 1981, the Familiaris Consortio is as relevant today as it was then. The sacrament of marriage does indeed require a life of obedience to each other, and Christ. While it has so often been depicted as doing so, it should not threaten personal freedoms or hold back from promoting the dignity of women. It most certainly promotes responsible procreation and the education of children, basic necessities for the survival and continued development of mankind. It represents prepared ground for the development of inter-family relationships, for reciprocal spiritual and material assistance. On the other hand, the document recognised the disturbing degradation of fundamental values pertaining to marriage. These included the limitless independence of spouses in relation to each other; the misconceptions of authority between parents and children; the lack of transmission of family values; divorce; abortion; sterilisation; contraception and the corruption of the idea of freedom (of choice) or self-affirmation to the point of selfish well-being, which ultimately negates the notion of two people joining together in Holy Matrimony. No one, especially a husband, or a wife, or a child could possibly or honestly admit that 'negotiating', 'processing' or taking any or all of these challenges 'on board', as members of a family, is easy to achieve, especially in the world we live in today. But it may well be truly argued that Joseph, Mary and Jesus lived in even more challenging times, considering what lay before them. We are fortunate in Ireland, to live in a relatively stable environment. Many families however are living below and just slightly above the poverty line. And while our constitution grants families the necessary protection, the tide of disturbing degradation of fundamental values rises with each passing day. This is the primary type of family unit that the Constitution under article 41 seeks to protect. The family recognised and protected in Articles 41 and 42 is the family based on marriage. In The State (Nicolaou) v An Bord Uchtála, Walsh J in the Supreme Court judgment stated that it was: ... quite clear ... that the family referred to in [Article 41] is the family which is founded on the institution of marriage and, in the context of the Article, marriage means valid marriage under the laws for the time being in force in the State. Support for this view derives from Article 41.3.1°: The State pledges itself to guard with special care the institution of marriage, on which the family is founded, and to protect it against attack. The Central Statistics Office has been in the news recently, highlighting the growing 'maturity' - in age - of those men and women, taking the marriage vows. That aside, 22045 marriages were recorded in 2014, in Ireland. 59.3% of these (or 13072) were listed as 'Catholic' unions. Of the non-religious marriages, 28% were recorded as civil ceremonies. All 22045 marriages were contracted between men and women. The CSO also states that 392 civil partnerships ceremonies were recorded in 2014. Of these, 242 were male unions; 150 were female unions. Overall, the percentage of these unions is less than 2% when measured against the figure for marriages contracted between men and women. In a recent statement to all Catholics, in advance of the referendum to change the meaning of marriage in the Constitution of Ireland, Irish bishops rightfully stated their opposition to the amendment. The bishops should be buoyed by the fact that, irrespective of the outcome, almost 60% of all recorded unions between men and women, in 2014, were done so in accordance with the sacrament of Holy Matrimony. The bishops also highlight their fears that mention of 'mothers and fathers' may be removed from 'a whole raft of previous legislation'. Should these fears become a reality, then the act of removal could be viewed as an overblown, paranoid exercise, done in the name of overweening, Orwellian political correctness, by those who implement it, especially when considered in the light of overwhelming statistics. What's important is that as long as men and women can be united in Holy Matrimony in the presence of God the Father and Mary, the Mother of Mercy, and be free to do so, then these legislative expediencies can be tolerated by all reasonable men and women, and be seen for what they really are. But if the day did arrive in Ireland, when men and women are prevented from praying to God the Father and Mary, the Mother of Our Saviour, Jesus Christ, then that will be truly a time to fear, just as Joseph, Mary and Jesus once did.